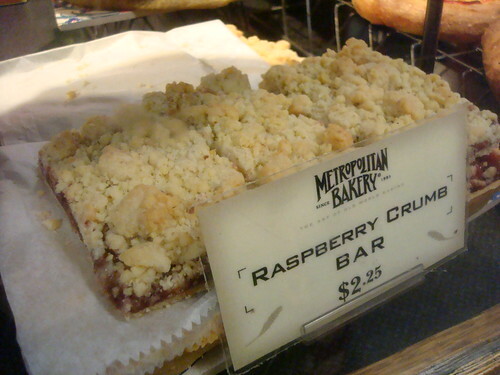 Photo: Metropolitan Bakery facebook pageI have a big, sweet, carbohydratey crush on Philadelphia's Metropolitan Bakery. Why, you ask? Well. There are a few reasons. First off, they make wonderful bread. This is important. But sometimes, when a bakery excels at baking bread, their sweet treats seem secondary. And I get it--bread is their "thing". But very happily, Metropolitan Bakery doesn't fall into this category. 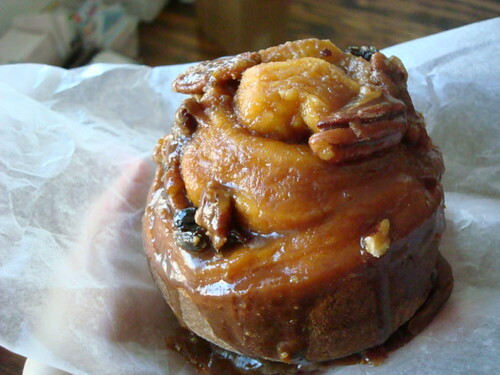 First, I will address their sticky buns. Like, whoa. Nice and yeasty, but with a pleasing amount of gooey filling, these buns are generously bathed in a caramelly coating and topped with pecans, making for a decadently delicious breakfast treat. I heated mine a little bit, and it sort of tasted like heaven. Really. I think I heard the "Dream Weaver" music playing. Next, I will address their lemon bars. Now, by appearances only, the lemon bars are fairly average. I don't mean this as an insult. All that I am saying is, how could you know that this unassuming bar holds such a treasure of flavors? Assertively--nearly puckeringly--lemon, these cool and tart bars are anchored by a rich, buttery shortbread crust. Please, let me have another. Next, I will talk for a moment about their raspberry crumb bars. Once again, not saccharine sweet, and beautifully finished off which a slightly salty, very buttery brown sugar crumb topping. I can see how one could even convince oneself that it's vaguely healthy. Speaking of vaguely healthy, they also offer something called a Millet Muffin. Now, in general, such a title would not entice me--but wrapped in liner paper that made them look like little flowers, I was intrigued. And I was assured by the counter lady that they were very, very good. "Are they healthy?" I asked. And she said, "Well, not really". That's all I needed--"I'll take it!" I said. And you know what? These muffins are very good. The millet adds a nice, nutty flavor and a wonderfully crunchy flavor which doesn't fall into "crack yo' teeth" territory--but the muffin base is deliciously dense and buttery. I call it a winner. And because this stuff contributes to the overall bakery experience, I should say that as an artistic person, their logo, which is inspired by the Paris Metro, pleases me greatly. Their menu is pretty extensive, featuring cakes, cookies, Frenchie-stuff like caneles and macarons, and tarts. And everything I have sampled has been quite good. What I am getting at here is: go to this bakery. Metropolitan Bakery has a few locations in the Philadelphia area; find out more about them on their website.